The People at YES are the Best in Utah Staffing and Recruiting! This month we would like to recognize an employee who has stepped up to the plate big time recently and is running an office of ours that many people might not realize we have. DeNae Paspuel has been working two jobs while enrolled at Utah State University and is helping us manage our location in the Logan area. She has been doing it mostly alone and has been doing a great job! We want her to know that her efforts are not going unnoticed and we are appreciative for everything that she does! Thank you so much DeNae for being our YES away from YES. You rock!! Rock climbing, running, camping, food, and sleep. Cats, close toed shoes, and not having A/C. What I like most about working with YES is how well they treat their employees. The owners are really the most genuine people and I think that's awesome. Maybe having a specific test for the more clerical positions. Probably a three-way tie between Johnny Depp, Natalie Portman, and Charlie Hunnam. I don't know if I should say it's my favorite place since I've never been, but Ireland. 7. Ski or snowboard. Why? Snowboard. I can't ski to save my life… I don't know why my brain doesn't get the whole skiing thing. Patience. I am not a patient person, and waiting on clients or temps kills me some days more than others. I try and just remain chill and keep busy, remember that some things are out of my control. That we are a good company to work for. We can do anything from long-term to temp work. 11. The summer olympics are in full swing right now. What Olympic sport do you think Reed Laws and Kerry Westenskow (the president and vice president of YES) would dominate in? Why? Who would be the better overall olympian? Oh man. I feel like I don't know how athletic either of them are… Haha, I think i would have to go with golf. And I think I would have to go with Kerry, but Reed as a close second because I think I heard Kerry golfs a lot and is pretty good. 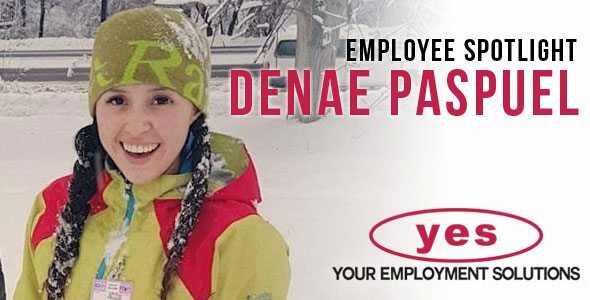 Thanks DeNae for all that you do to make YES the best staffing company in Utah!